Blofield Primary School aims to provide a high-quality physical education curriculum which inspires all pupils to participate, succeed and excel in competitive sport and other physically demanding activities. We aim to provide as many opportunities as we can for pupils to become physically confident which supports their health and fitness and develops character through the school values such as perseverance, challenge and respect. The School has already established an outstanding extra-curricular program it will look to consolidate and develop further in the coming year. One of the aims will be to increase participation levels and to target children who do not take part in physical activity or sport either in school extra-curricular activities or with other outside providers. With the introduction of the new funding the school will look to spend more time during curriculum lessons highlighting the importance of PE and sport in the maintenance of a healthy lifestyle. The funding this year will be spent developing existing teachers knowledge and understanding of physical education through CPD opportunities and we are especially excited about including some forest school activities to our curriculum. The main part of the fund will continue to support and develop the children of the school providing expert teachers and coaches to either support, professionally develop our existing staff, or the children themselves. Some of the funds will go to help with transport costs to and from sporting events allowing more children many more opportunities to take part in competitive events and festivals. Thank you very much to all those parents who found the time to fill out the surveys that were sent home last week. As the school’s PE teacher, I am very proud of all of the effort that both you and your children put into taking part in sports and physical activity. It is vital, in their formative years, that the children understand the importance physical activity in their lives so that they will continue to be active into and throughout adult life. As regards to moving forward it would be fantastic if we could find activities for the small percentage of children that do not currently take part in any physical activity in addition to their two hours of school PE. If this is something that you might be interested in please feel free to come and see me in school, my field is always open. In year 1 90 % of children were taking part in at least one hour of after school sport with 78% taking part in at least 2 hours. In year 2 94% of children were taking part in at least one hour of after school sport with 87% taking part in at least 2 hours. Generally I am really happy with the results and am glad that parents make the effort to engage their children in after school sport and activity. It is encouraging to see that so many of our younger children do lots of different activities in their spare time. For the future I would like to work on getting the zero and one hour after school to increase by at least one hour each week. In year 3 94 % of children were taking part in at least one hour of after school sport with 87% taking part in at least 2 hours. 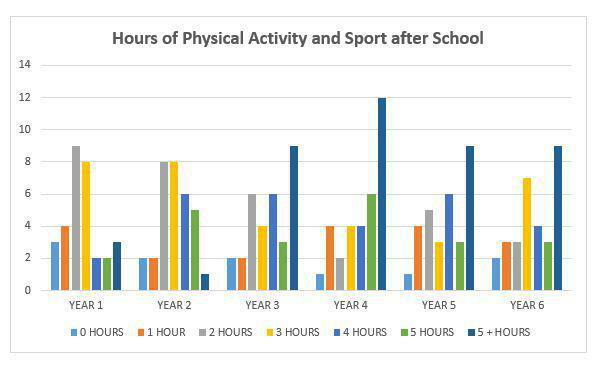 In year 4 97 % of children were taking part in at least one hour of after school sport with 84% taking part in at least 2 hours. In year 5 97 % of children were taking part in at least one hour of after school sport with 84% taking part in at least 2 hours. In year 6 94 % of children were taking part in at least one hour of after school sport with 84% taking part in at least 2 hours. The Key Stage 2 results show that our children are generally taking on more activity and sports participation after school has finished when compared to Key Stage 1. The numbers of children moving to 5 and 5 plus hours per week is very encouraging. The figure currently stands at 43%. The survey offered the opportunity for both parents and children to express their views, both positive and negative, about the PE experience at Blofield. It was nice to see that there were few children that didn’t like PE and most stated that fun and working with their friends was important to them in PE lessons. Where children did not enjoy PE their reasons related to the weather or tiredness. A few stated that success was important and that working in non-friendship groups had an effect on their enjoyment. The last question on the survey asked for comments that might help to develop PE at Blofield. The comments were mostly positive and ranged from broadening the opportunities for children Dance/Gym clubs, Karate Canoeing and Climbing, to reward systems and extra lessons. Our Sports Grant for 2016/17 was £8,910 and has provided the children of Blofield School with specialised teaching and coaching in a wide variety of sporting activities, e.g. tag rugby, tennis, gymnastics, cricket, football and athletics. Some of the money went towards expanding our curriculum to include some outdoor and adventurous activity days for some of Key Stage 2 children. The impact of using the funding in these ways boosted participation at both after school clubs and outside of school clubs with links to the school. As you can see from the tables below lots of our children had the opportunity to participate in School Games competitions, with some going on to represent the Norwich East Partnership in the County Finals. The funding was used to support all children in the school to access and develop in as many sports as possible. For example, some of the fund was used to develop our high achieving sports people and some was used to encourage children who don’t take part in any sport outside of P.E. lessons. A small part of the fund was used to help develop the teachers’ who deliver the PE curriculum to the children of Blofield School. Participation levels in extra-curricular clubs was excellent with over 80% in the autumn term, 75% in the spring term and 85% in the summer term, of all children in Key Stage 1 and 2 taking part in one hour of after school sporting activity, and over 50% taking part in at least 2 hours. We envisage that all of these high levels of participation and activity will be sustainable through the hard work of the teachers who all contribute by running a vast extra-curricular programme not just in PE but in other areas too. The school has achieved the silver Sainsbury’s School Games award.